Dwight Howard seemed to be unstoppable. Two Cleveland Cavaliers tried their best to stop him from shooting, but he easily “rose up and gently flicked a hook shot over the defenders. Swish!” Then they tried three. “Dunk!” Magic fans may have been anxious to see their star put on a mean face, but it simply wasn’t going to happen because, as Dwight claims, “I’m going to laugh, because it’s fun. Some people want to see a mean streak, but that’s just not me.” He smiled and laughed when he played for the Southwest Atlanta Christian Academy in high school and hasn’t stopped smiling since. He’s a guy who, in no uncertain terms, is in love with the game. His parents, Dwight, Sr. and Sheryl dubbed him the “Miracle Child” because they “lost seven children to miscarriage” before he arrived on the scene. They taught him discipline and character, two much needed qualities that he readily absorbed. Dwight was a team player who was more concerned with winning that his own stats. In high school he was known as “Mr. Basketball” and was “widely considered the nation’s best high school player.” He dreamed of becoming the first pick in the NBA draft and certainly wasn’t disappointed when The Magic picked him up...first. Coach Johnny Davis said, “Now he’s gone from the kiddie pool to the adult pool.” In this book you’ll learn all about how Dwight exceeded even his own expectations and you’ll be able to follow all 6-foot-11, 270 pounds of him to the top levels of the NBA! If you are a big fan of the smiling “Superman” Dwight Howard, you won’t be disappointed with this book. The young basketball fan who wants to learn more about Dwight will be excited to learn everything about him from his childhood in Swainsboro, Georgia to the five-year $80 million dollar contract he snagged from the Magic in 2007. I enjoyed the easy, comfortable pace in which this biography unfolded and was quickly drawn into the book by the first action-oriented chapter. There are numerous full color action photographs and several sidebars that give interesting personal information. In the back of the book is an index, a glossary, selected career highlights, and additional recommended book and website resources. 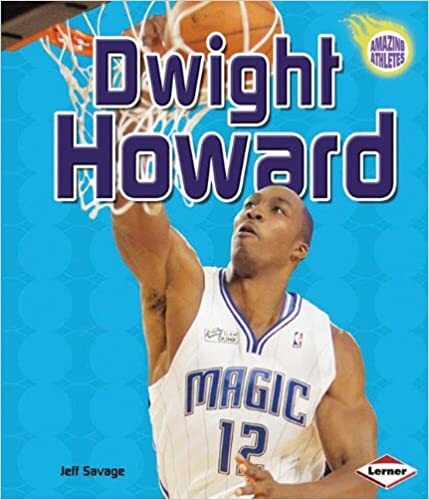 Quill says: If you have a young basketball player who loves not only the game, but wants to learn more about hot players like Dwight Howard, this is one "Magic" book you might want to consider!